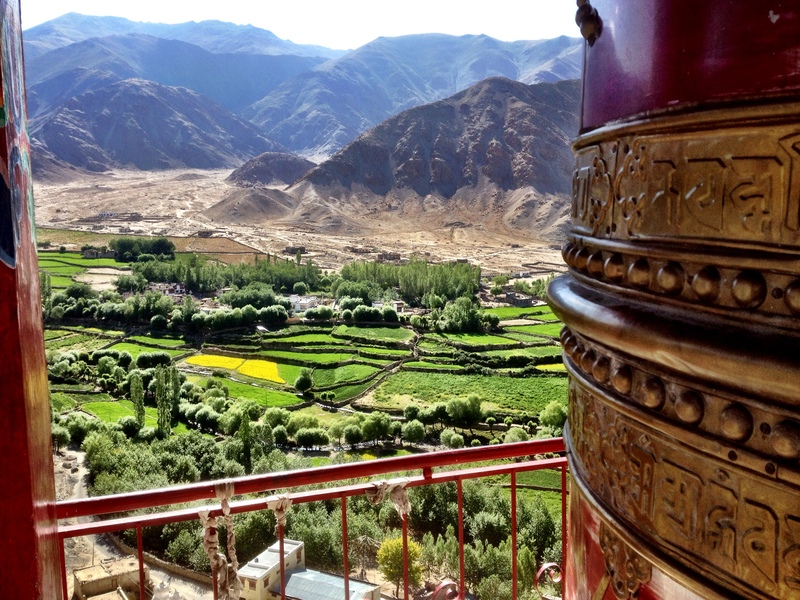 The Buddhist monasteries of Ladakh are nothing if not, breathtakingly spectacular. All of them, centuries old, are built into sheer cliffs or upon bare Himalayan mountain-sides. Monastic white buildings sprout from the grey rock – almost blooming – like some special, magical expression of the mountain character. We loved going to the monasteries. They were such amazing spaces and allowed me to tap into a part of myself that I usually find so hard to reach. 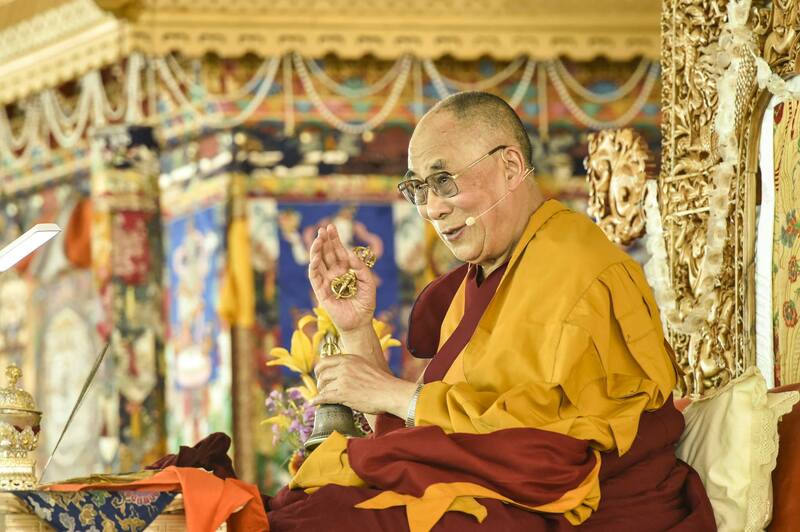 Everything about them invokes a sense of ancient wisdom – the smell of the incense, the old wooden structures, faded winding prayer flags, crumbling paintings, the alternating sounds of silence and Tibetan instruments in puja. Moving in each gompa, we were compelled to meditate, unable to escape the residual energy borne from centuries of contemplation on the nature of reality. 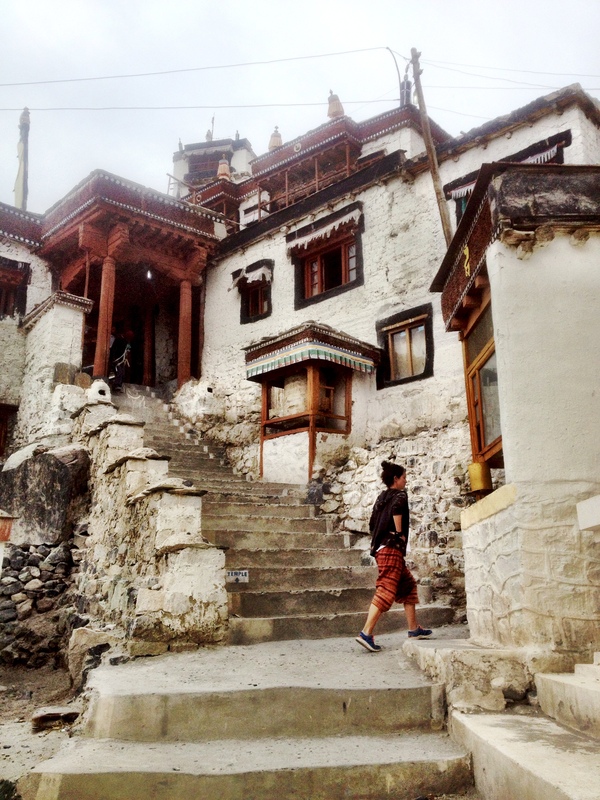 There is something very special about these monasteries. Several specific experiences spring to mind. 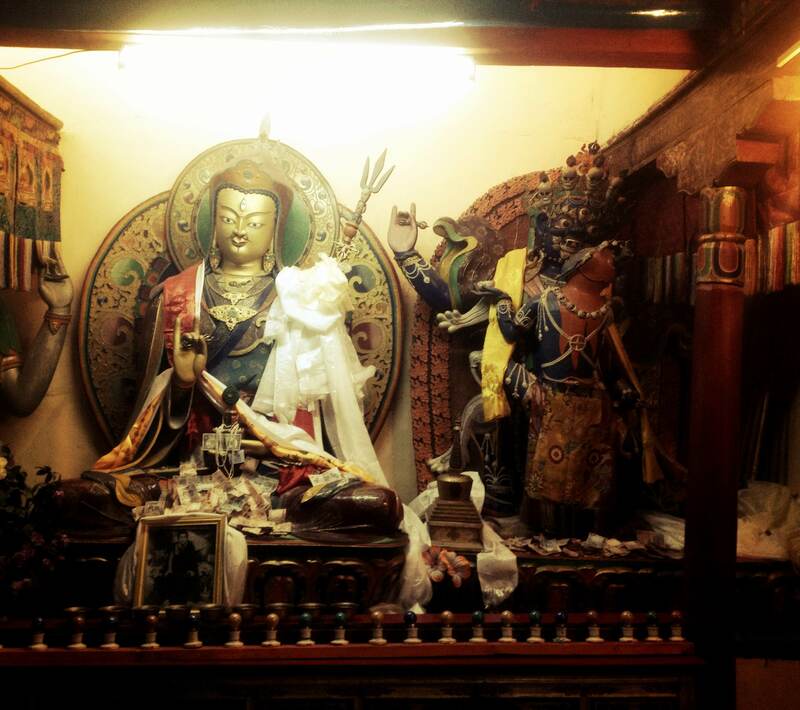 In Sakti, we visited the Taktok monastery, literally built around a cave where the great Indian Sage and ‘Father’ of Tibetan Buddhism in Ladakh, Padma Sambhava meditated. Cut off from the outside sounds, the silence in the cave has an amazing resonance. You can literally hear the silence, and it clears the mind immediately. 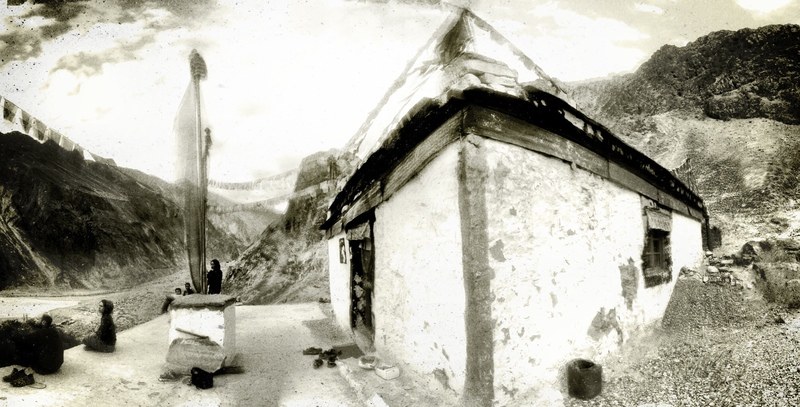 In the same village there is the less renowned Tuphuk gompa. We had been walking around Sakti for an hour, and for some unknown reason I felt incredibly drained, more so than I should’ve from such a short walk. 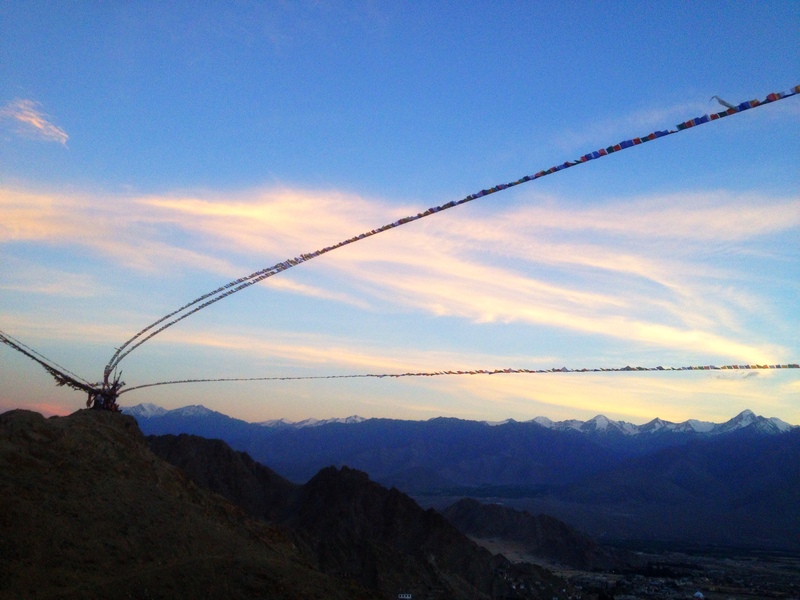 Passing below the gompa, we heard the sounds of the sunset puja emanating over the village. 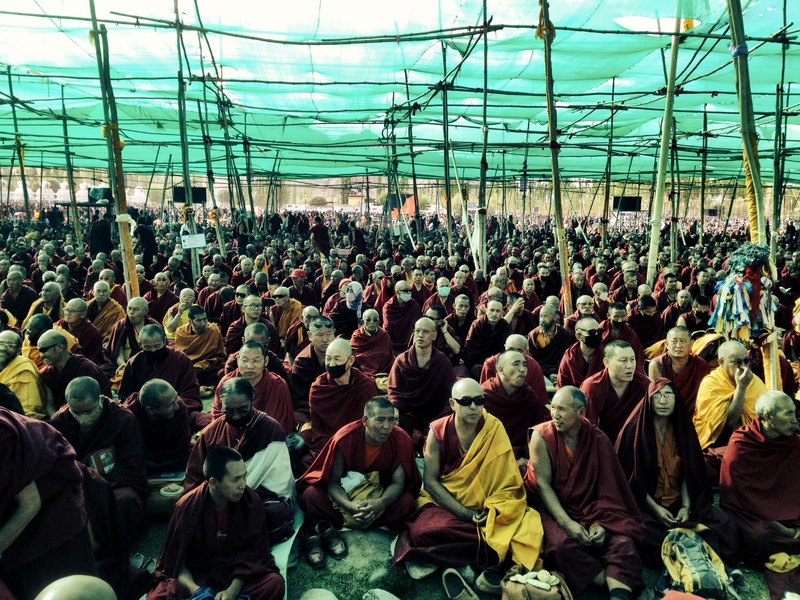 We climbed up to find not a congregation, but a sole monk – his entire brethren had gone to Kalachakra. We sat down and let the sounds of his chanting, the drums and cymbals wash over us in meditation. For who knows how long, it was just the three of us and the incredible sound of the puja. When we left, I was magically refreshed. No lethargy, no exhaustion, no illness. 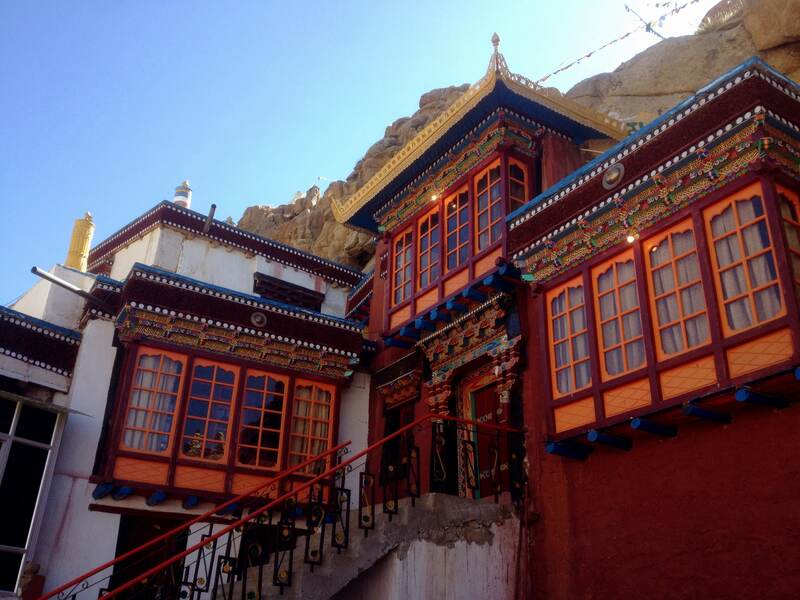 Hemis is perhaps the most important monastery in Ladakh. One of the lineages of Tibetan Buddhism, Kargyu-Drukpa, flourished here. 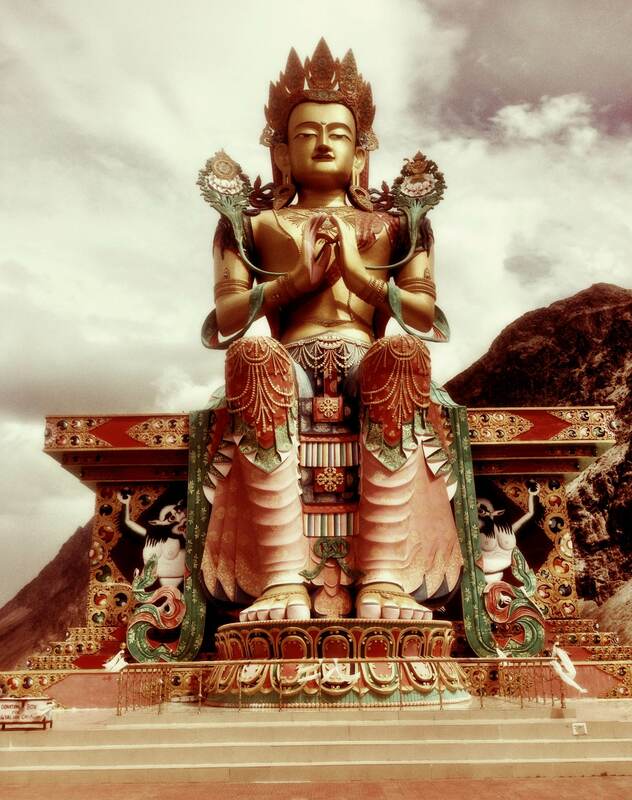 The main gompa is so beautiful it almost brought me to tears. More so than any other place in Ladakh, you can feel the sense of history in that gompa: be it the fading beauty of the decorative cloth piece that hangs from the ceiling, or the massive, ancient wooden pillars that seem to support the very foundations of Buddhism itself. It is a stunning, sacred space. 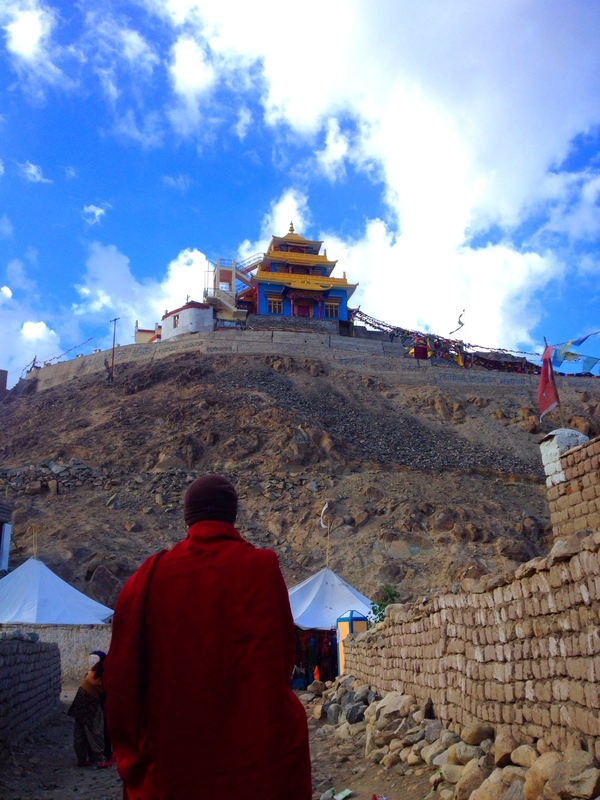 In contrast, Turktuk has the smallest Buddhist structure in all of Ladakh. Perched on a hill, It is a small, comfortable room, mostly empty except for modest statues of the Buddha, Tara and Manjushri. The village is muslim, and no monk is present. However, someone in Turtuk dutifully maintains the gompa by cleaning it, stocking it with supplies and lighting incense and butter lamps everyday. It is beautiful in its simplicity. One morning we trundled up to the plateau where the gompa is situated – hoping to do yoga outside and take in the spectacular sunrise views of the village below. However, the weather soon turned foul and we had to rush inside the gompa to escape. We found ourselves trapped in the room, alone, in the darkness of the overcast dawn, with the sound of the wind and rain thrashing the side of the gompa. There was nothing to do but surrender to the circumstances, be in the moment and go inwards. 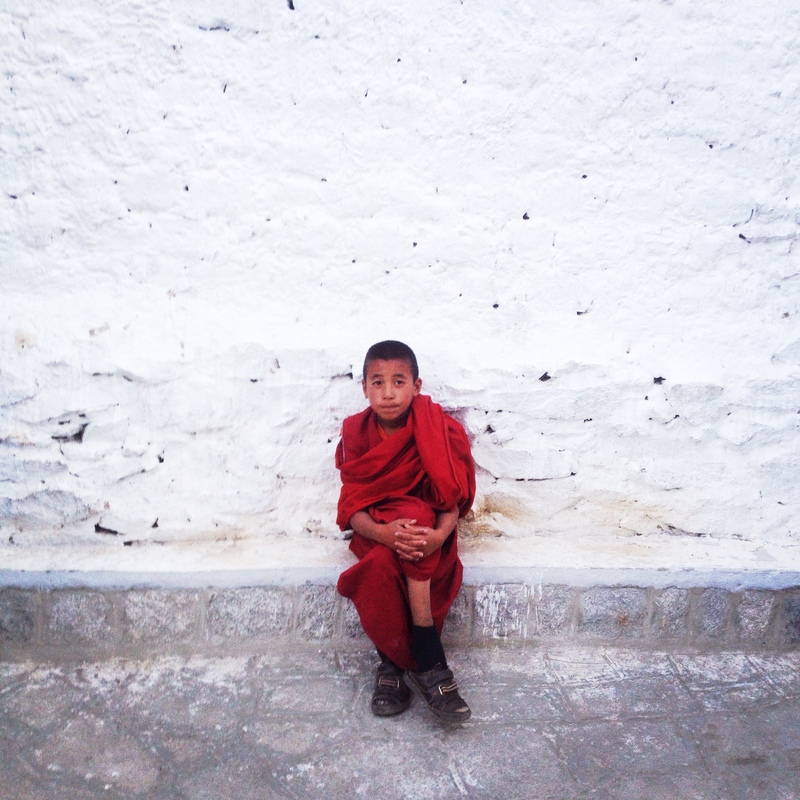 In total we visited eight monasteries in Ladakh: Leh, Thiksey, Hemis, Taktok, Turtuk, Tuphuk, Stakna and Diskit – all were amazing in their own way. 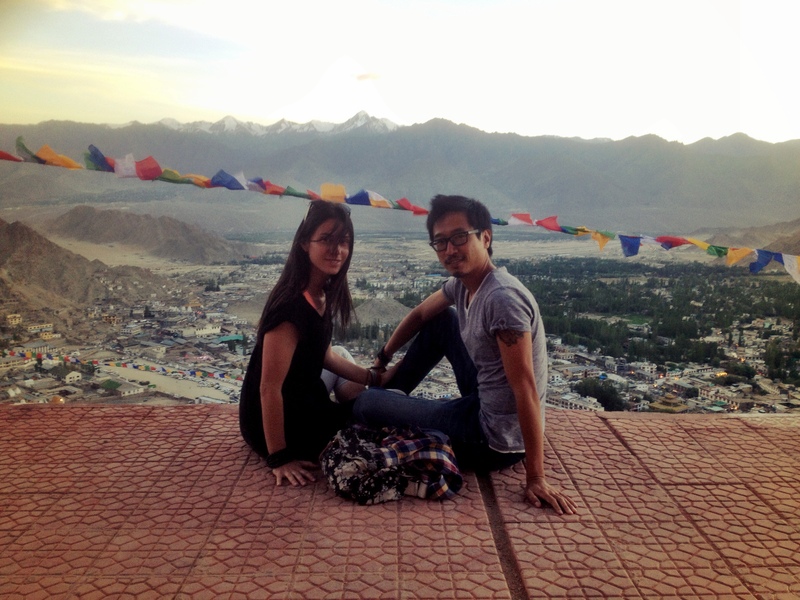 We feel very blessed to have spent time and experienced the energy of one of the few places on Earth that still carries the true essence of Tibetan Buddhism. The Kashmiri bus fare collector is full of facts. “You know India is a big country. Very big country.” he beams, with that special brand of pride exhibited only by rickshaw / chai / bus fare wallahs when they discuss India with foreigners. “There is 30 uh-states in India and 35 languages. Many languages in India. 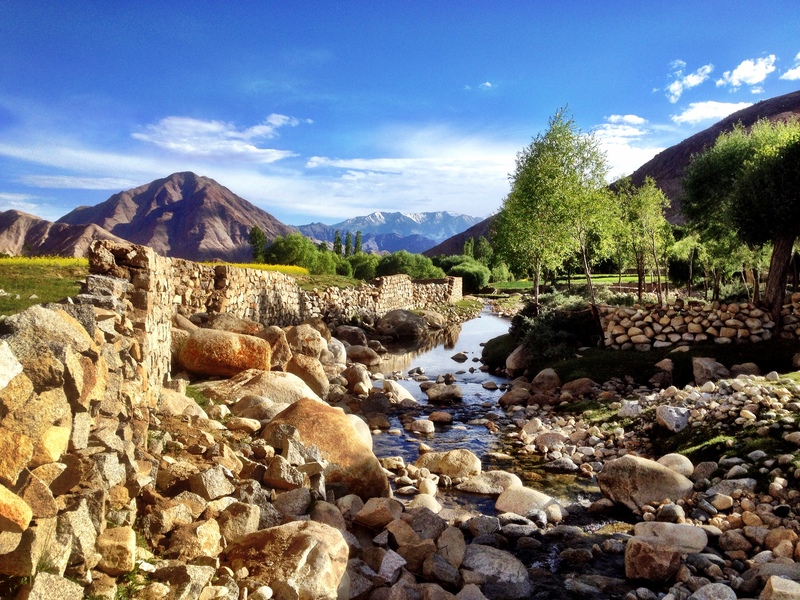 In Ladakh they speak Ladakhi, in Jammu there are Urdu, in Kashmir, Kashmiri. So even in one uh-state there is three languages.” The way he says ’states’ is endearing. He prefaces it with a half-syllable that sounds a bit like ‘uh’, but shorter. It’s reminiscent of the way Spanish speakers say ‘sp’ words in English, like special or spring. Especial. Espring. Uh-states. The Kashmiri bus fare collector is nice and smiley. “Where are you from?” comes the tried and true Indian conversation filler. “Aaah Ricky Ponting! Good cricket player. Very good captain.” The Kashmiri bus fare collector’s factoids extend to cricket, but clearly not to the recent past. I try to tell him that Ricky Ponting is no longer the captain but he interjects. “Australia is a very good at cricket. But Indian team is better!” He rattles off some Indian cricket player names as proof of his statement, while I politely nod and return his smile. 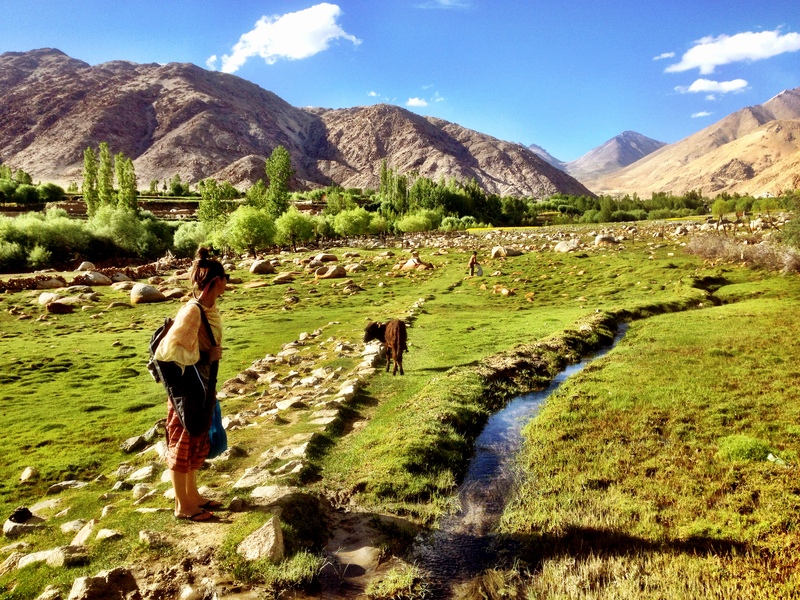 All of a sudden there is a cold sensation, and the Ladakhi girls just ahead of me scream. Someone in a passing vehicle has played a practical joke by throwing a bucket of water at the passengers seated atop our bus. It’s a shock, but quite a welcome one as we’re travelling in the dusty midday heat. 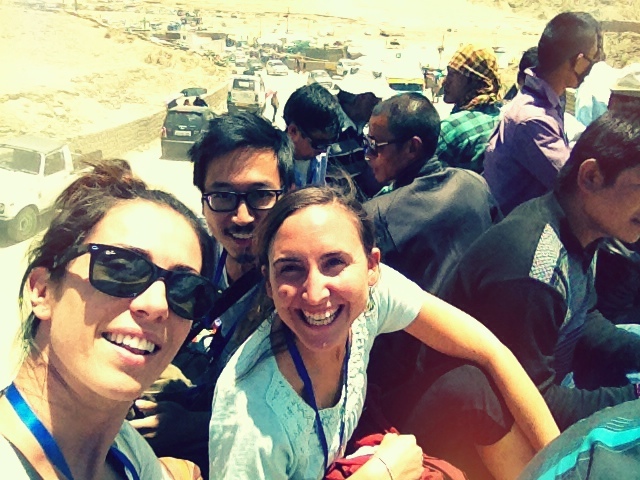 The collective astonishment quickly transitions to laughter and there’s a jovial atmosphere on top of the bus to Leh. Of course, the locals, and particularly the Kashmiri bus-fare collector have done this before. We (Mesi, our friend Noa and I) are the wide-eyed rookies, grinning stupidly and taking selfies as we live the Indian traveller dream of riding on top of a bus. To our fellow bus surfers it’s nothing more than another ride. As if to mock my exuberance, there’s a Ladakhi toddler next to me fast asleep. We enjoy our ride on the roof of the bus. I take in the sights from my ultimate ‘window seat’ – a local carnival, a jeep full of monks travelling red and yellow in front of us, a monastery set up on a hill. And as the foreground changes, always in the back is the stark, captivating Ladakhi landscape. 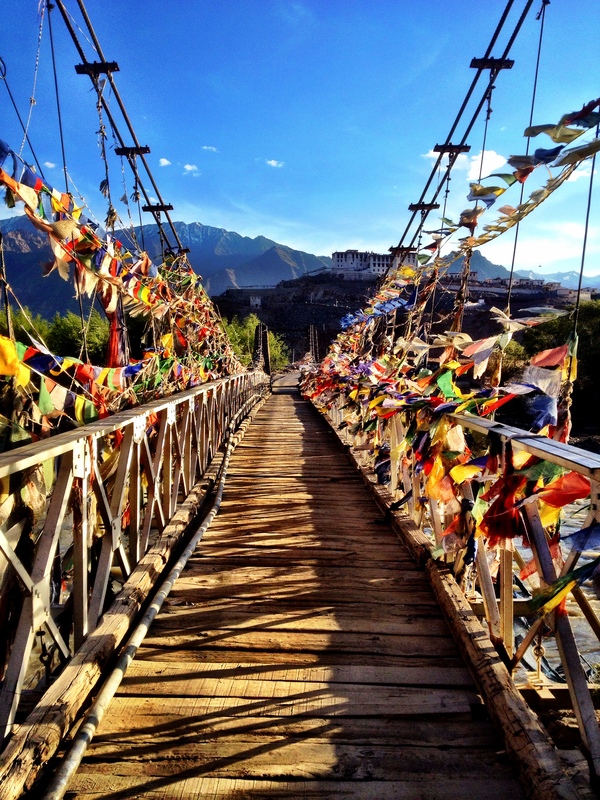 I feel the wind and touch passing prayer flags, strung up between poles above the road. It’s exhilarating. The toddler next to me continues sleeping. India: always providing opportunities to practise patience. CHALLENGE: Bags didn’t arrive with us. But that’s ok because they’ll be here tomorrow and Aeroflot will send them express to Amritsar. CHALLENGE: One backpack didn’t clear customs and so they can’t send them together. But that’s ok because we’ll be flying back through Delhi airport in a few days, we can pick them up then and we have enough clothes to make it till then. CHALLENGE: Mesi has Delhi belly. But that’s ok because Brad is totally fine and it doesn’t stop us from seeing the Golden Temple. But that’s ok because we are rescheduled onto another flight. CHALLENGE: That flight is 4 hours IN THE PAST. But that’s ok because (after a bit of panic searching) there is another flight with a different airline at 2am which we can buy new tickets for, which will allow us to get our tight connection to Leh, at 530am. All we have to do is wait in Amritsar airport for 6 hours. 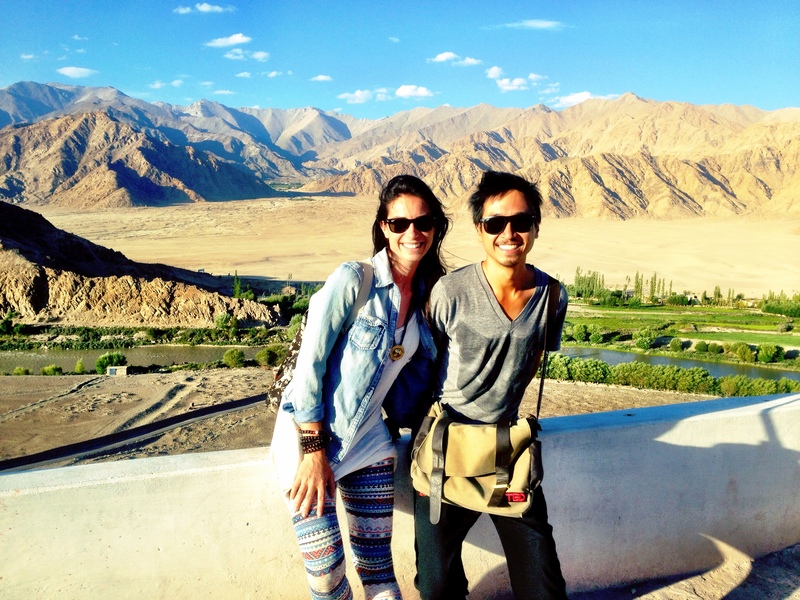 CHALLENGE: Brad has Delhi belly. But that’s ok because there is a doctor at the airport. CHALLENGE: The doctor doesn’t speak English and we don’t speak Hindi or Punjabi. But that’s ok because the one english word he does know is ‘photo?’. So after dispensing pills (four to Mesi and one to Brad – strange because we have the same symptoms) he takes a happy snap of two sick foreigners. At least someone leaves the transaction satisfied. CHALLENGE: Get to Delhi airport and we need to find the Aeroflot person to get our luggage. All turns out ok, she’s waiting where she said she was, tells us to go upstairs meet another colleague and we’ll have our bags. CHALLENGE: She only has one bag. But that’s ok because we can go to customs and clear the other bag. CHALLENGE: It takes 90 min (!) to do the ‘paperwork’ to clear customs and we have to leave on a flight in 60 min. But that’s ok, we have cross-packed gear into each other’s bags so we can manage. At least we’re here and we board the flight to Leh (both sick). 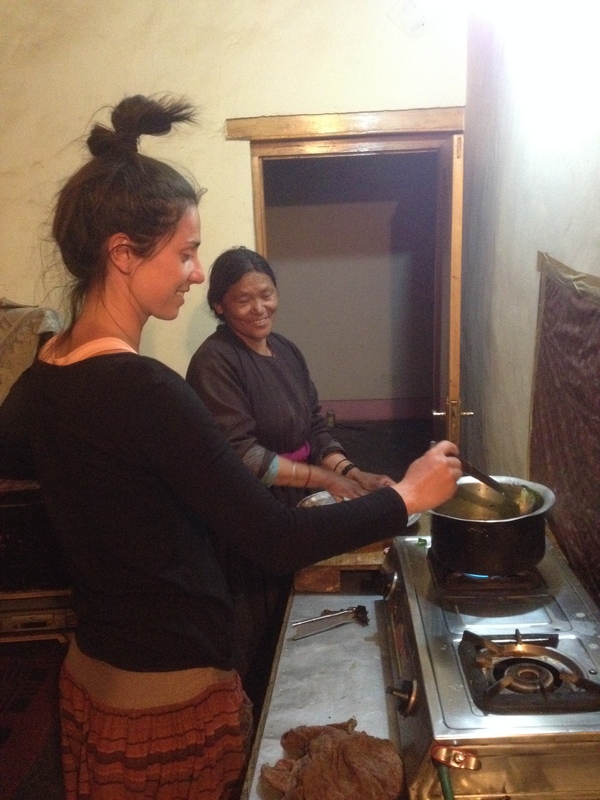 CHALLENGE: Get to Leh and the accommodation we booked has been given to someone else. But that’s ok, because by now we’re used to it, and luckily there’s space in the guest house next door. CHALLENGE: After coming off the symptoms of Delhi Belly, altitude sickness kindly decides to take its place. This is fun. 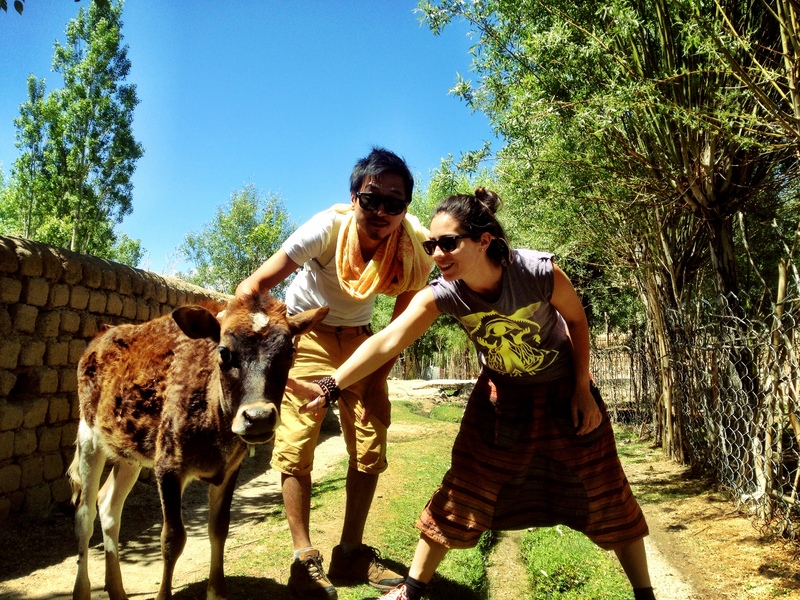 But that’s ok because today is our fourth anniversary, we’re in Leh, it’s beautiful here and we are seeing the Dalai Lama!